Sake was born in 1987 and came to us from the Scripps Institution of Oceanography with minimal training experience when she was a little under two-years old. 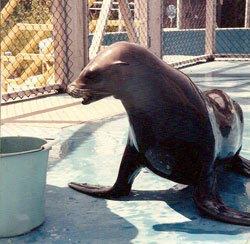 Before Scripps, she was stranded and rehabilitated at Sea World in San Diego. She participated in our research studies, educational demos, and open ocean work.In 1998 we were honored to have Sake selected as the official mascot of the U.S. Pavilion for the World Exposition in Lisbon, Portugal. She was truly an ocean ambassador who touched the lives of thousands of people throughout her life in various ways, including public outreach programs, research projects, volunteers and many more. To read more about her amazing life, please read her eulogy written by Dr. Zeligs. 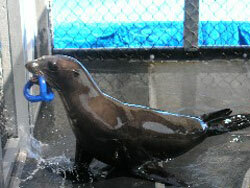 Beaver began his training career with the Navy's Marine Mammal Program when he was a young pup. In 1988, when he was 10 years old, he joined Dr. Zeligs at Long Marine Laboratories. He then moved with the SLEWTHS project to Moss Landing Marine Labs in 1998. Beaver took part in nearly every aspect of marine mammal training: cooperative research, public outreach, open ocean work, and Hollywood work. He was an excellent ambassador for his species and the ocean environment. Beaver touched thousands of lives with his public outreach appearances, and also made a difference in the lives of all the volunteers who had the joy of working with him. Sadly, Beaver passed away in March 2010, after a very long, very inspiring life. He will be missed by all those who had the pleasure of knowing and loving him. Please read individual testimonies of Beaver's impact on his memorial page. 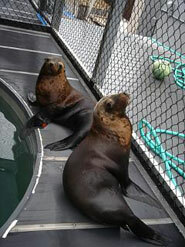 Nav and Diego came to SLEWTHS from the Marine Mammal Center in Sausalito, where they were "bounce-back" rehabilitation patients. Multiple release attempts took place with Nav and Diego, all of which were unsuccessful. They came to SLEWTHS and took part in their "basic training", learning how to go to the water when asked, hold there, and target. 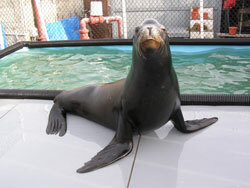 Zoey came to SLEWTHS in early 2005, with Cali, from SeaWorld San Diego. She learned all of her basic behaviors here, and left later in 2005 to join Sparky at Sea Lion Splash. She has become one of the main stars in the Sea Lion Splash show, and entertains audiences across the country. Sparky joined the SLEWTHS family in Summer 2003. She came to us with Ariel, from SeaWorld Orlando. Sparky took part in her basic training with us, and left to join the Sea Lion Splash family (part of Squalus, Inc.) later in 2003. She currently travels with Sea Lion Splash, entertaining audiences at public outreach events. Jonah, came to SLEWTHS in 1997 from SeaWorld as a stranding victim of El Niño. He has been with SLEWTHS almost his entire life, and has an extensive training background that spans multiple training disciplines, including: cooperative research training, multiple voluntary medical procedures, education and public outreach training. Jonah now currently resides at the Houston Zoo in Texas. Click here to learn more about Jonah while he lived with us. 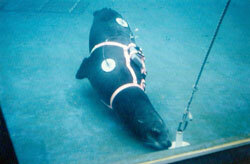 Hoover came with Beaver to Long Marine Laboratories from the US Navy Marine Mammal Program. He was one of the animals involved in Dr. Jenifer Zeligs' doctorate thesis. Upon his departure from LML, Hoover moved to SeaWorld San Diego, where he has sired multiple pups in their sea lion feeder colony. Sushi came to Long Marine Laboratories with Sake. She, like Hoover, aided in the research involved in Dr. Zeligs' thesis, and then made her way to Gulfworld in Florida. 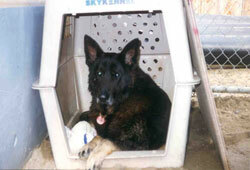 After being abandoned by her previous owner Fluffy joined the SLEWTHS Project in September of 2004. 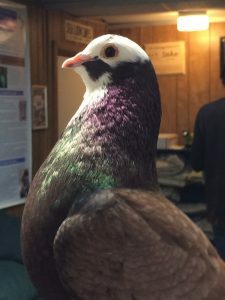 Fluffy was the first pigeon the SLEWTHS Project had and she provided the SLEWTHS staff the opportunity to work with another type of animal. Sadly, Fluffy passed away in May 2011 but not before making her mark on the project and with the staff that had the pleasure of working with her. She was our pigeon pioneer! Lassie was a German Owl Pigeon, who joined the SLEWTHS family in May of 2011 as a companion piegon for Shamu. Lassie was a great addition to the SLEWTHS family and learned many behaviors over the course of his time here. Unfortunately, Lassie passed away in July 2014 but his flare and enthusiasm to learn will be missed. Shamu was born in April 2010 and eight months later, in December, came to the SLEWTHS family as our "Christmas Pigeon". Shamu is a very smart, eager pigeon. He has a small arsenal of behaviors that is expanding every day. Shamu offers our staff another opportunity practice novel training techniques and is a great asset to our collection! After a long beautiful life of seven years, Shamu passed away in December 2017. Shamu will be missed by all who got the chance to train and learn from him. 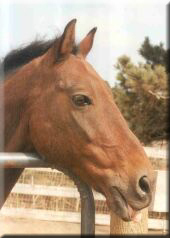 Smitty is a Morgan Horse, who was a member of the SLEWTHS family from September 2001 through October 2009. He took part in a variety of Parelli Natural Horsemanship training, as well as bridge and target training. He was an excellent training ambassador during Dr. Zeligs' classes. Smitty moved to Southern California in 2009, to live with one of Dr. Zeligs' students, Amanda Meyer. His training has continued with Amanda, and he is very happy and healthy. Spock was Dr. Jenifer Zeligs' dog before becoming the "lab dog". He lived on site at the SLEWTHS shore lab facility, where he enjoyed a long life interacting with the SLEWTHS staff and acting as a lab guard dog. A few of Spock's favorite activities included his morning walks on the beach, and playing with the volunteers. Spock passed away in 2001, but his memory lives on with the staff. There is a dog paw print engraved on one of the wood pilings that stand on stage at Sea Lion Encounters, acting as a lasting legacy for this wonderful canine companion.